Today, after living nearly fourteen years in distress, in my thirst for justice, it is a day of hope. The sun is shining in my heart. Every day, for fourteen years, I have been looking through my mail in the hope of good news. A month ago, while surfing on social networks, unexpectedly, I saw my picture with the news that I had been nominated for this year’s GUE/NGL Award for Journalists, Whistleblowers and Defenders of the Right to Information in honour of Daphne Caruana Galizia. What an honour it is to be associated with her. With this award, the memory and work of Daphne will live with us forever. I am very pleased to see that through this award, the importance of food safety, public health and human rights is being recognized. It is my hope that we may continue to draw the attention of the public to food safety management. I also hope that this award gives courage to employees in food and other businesses to stand for ethical practices and speak up when the health or interests of the public is at risk. On this occasion, I would like to express my deepest gratitude to those who have nominated me, to the jury who has honoured me with this award and has given me the opportunity to speak in this forum. Also, I wish to express my warmest thanks and appreciation to those who believed in me and have stayed by my side during these diﬃcult years. I hope that at this occasion I can be the voice of other whistleblowers in Switzerland, in France or elsewhere in the world, as well as those victims of abuse at work and those fighting for their justice. I would also like to acknowledge a heroine in my story, a former colleague who spoke the truth in court, acknowledging that I was subject to unbearable psychological harassment and that she regretted participating in the "game". My thoughts are also with my family who have had to endure the consequences of the events. My thoughts are also with my family who have had to endure the consequences of the events. Who am I and what did I do with my life? My name is Yasmine Motarjemi. I am a former senior scientist and Acting Director of the World Health Organisation. In my last position, I was an Assistant Vice President at Nestlé, in charge of global food safety. I held this position until 2010, when I was fired. It may be interesting for you to know that I was born in Iran but have a triple nationality in the countries of Iran, Sweden and Switzerland. However, today, I am speaking here as a citizen of the world. Nestlé management knew that it could control the public health authorities and manipulate the Swiss justice system. It also knew that if I took legal action, I would be ruined financially and professionally destroyed. So, today from this platform, I would like to speak to the world. I would like to speak about health and safety, about life - your life. I would like to say that, regardless of political inclination, race or religion, human life matters. I would also like to say that I stand for citizens' rights to know how the safety of products are managed and what some employees endure to ensure the protection of their health. I would like the public to know that we, whistleblowers, pay a high price for reporting information that the public need to know. 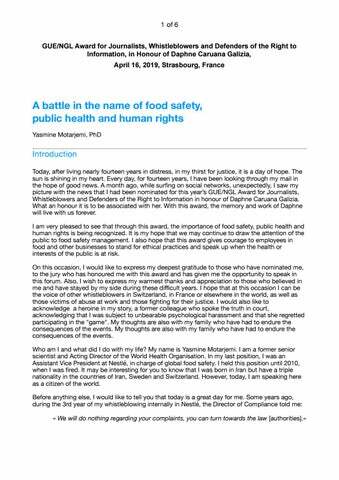 My battle for food safety, public health and human rights started 14 years ago. However, this was preceded by 25 years of hard work to improve food safety and public health in the world. In a competitive and macho world, the road to success was not easy. It involved many uphill struggles. My personal story of pain and suﬀering that Nestlé has inflicted upon me is nowhere near as important as the outrage that resides in me from my experience with the despicable manner that food safety has been managed in this specific case. Recently, in the USA, Nestlé recalled cat food on the grounds that pieces of plastic were found in the product which might may possibly cause choking. During the recall, Nestlé explicitly alerted consumers on the choking risks (1st April 2019). However, some years earlier in Europe, a Director of Nestlé France marketed a product - a biscuit for infants - which caused the choking of at least 40 infants1 per year over a number of years. At that time, a large number of parents contacted Nestlé, complaining and describing traumatic situations that they experienced. Yet, this manager ignored the complaints from the parents until I discovered the issue and intervened. In spite of his negligence, this manager was promoted and he became my superior. He continued his negligent attitude towards food safety and was proud of it. During my judicial case against Nestlé, he stated in court that he viewed that the product in question was safe. Consequently, the same problem, same error but with another product, occurred again in France in 2009 and 2012. From these incidents, at least one child died and another became handicapped. Can you imagine that, the parents of the handicapped child had to fight in court to receive some insignificant compensation? Yet, no one in Nestlé was held responsible for what I consider to be criminal negligence. Why is it that a health risk for animals in the USA is taken seriously and justifies a product recall, but in Europe, children are left to suﬀer, or even die, with the problem simply ignored? Another problem, another place. In 2008, in China (Hong Kong), Taiwan and South Africa, Nestlé products were contaminated with melamine, a chemical agent added to foodstuﬀ to falsify analysis of the protein content. The problem was in the raw material from China. And, Nestlé knew about the risks with the raw material because one year earlier, for the same problem, Nestlé had been implicated in a major outbreak in the USA which caused the death of an untold number of pets. for melamine until another major outbreak in China led to the intoxication of some 300,000 infants. This negligence rises to the level that we have recently experienced with the Boeing aircraft manufacturing company. Oﬃcially, the products of the Sanlu company were held responsible for the massive intoxication. However, the role of Nestlé remained unclear, as some of their products were also highly contaminated. In any case, if Nestlé had behaved in a responsible manner and checked its products, it could have detected the contamination, alerted the authorities to an ongoing problem and prevented this major historical food safety incident. To prevent the testing of products, the same person responsible for the choking of infants, who was now my superior, blocked my instructions on the management of chemical contaminants from being released. He issued a video to the food safety personnel stating that there was no need to check raw material for chemical contaminants. I asked for the video to be corrected, and as a result, I was further sanctioned. Nevertheless, these are not the most important issues when it comes to food safety management. They are only the tip or the visible part of the iceberg. They are only the symptoms of a deeper management problem. The problem is the managerial failures that led to those incidents: nepotism, a business structure that creates a conflict of interest for auditors, staﬀ working under duress, lack of competent staﬀ and a culture of fear that prevents staﬀ from reporting problems. Worse are the policies that encourage staﬀ to close their eyes to problems, especially if they judge that these problems can remain undetected. For instance, why did Nestlé refuse to test its products or raw material for melamine, which would have eventually led the company to recall its products and alert local and national authorities? Possibly, it may have been due to a policy of Nestlé that linked the annual bonus of managers to product recalls. This policy may have also played a major role in the harassment that I was subjected as my recommendations for transparency in food safety may have been viewed as a threat to receiving their bonus. Such a policy that encourages managers to take financial risks to the detriment of consumers would never be accepted in any bank. So, why do we accept it in the management of the safety of our food products? What happens when one blows the whistle against negligence and corrupted work ethics? Those who break food safety laws and principles have little regard for whistleblowing laws or company policies on the subject. Instead, after several years of excellent performance, Nestlé Management subjected me to a severe case of sustained and persistent psychological harassment, which felt like torture to me. For four years, while continuing to fulfil the responsibilities of my senior position, my superiors stripped me from my projects and prerogatives, dismantled my team, humiliated me, isolated me, defamed me, denigrated my opinion, blocked my instructions, withheld information, spied on me, threatened me, and they did all this and more without any regard for the implications of such practices. To give you an idea of what I endured, I once watched a film about a story that took place in the Middle Ages. To punish a slave, her master stripped her from her clothes, tied her to a pillar, and then ordered her lashed to death. This is how I felt as I was increasingly deprived of my prerogatives and projects and was humiliated day after day. The daily humiliations felt like being struck over and over with a whip. The isolation and exclusion from the professional world felt like a prison, a large prison without walls and yet still a prison as no one talks to you, no one sees you and no one hears you. Sometimes one wishes to be dead rather than go through such harassment. The daily torment increased over time in both intensity and abusive tactics. As I survived through this, senior management attempted to force me into either an impossible job so that I would fail, or a trivial and humiliating job to demoralise and break me further. I finally accepted the punitive internal transfer provided that there would be an investigation into my allegations about food safety mismanagement. They still refused to audit food safety, which was my key concern. Regarding my harassment complaint, after more than 3 years, Nestlé conducted a false inquiry without ever investigating my allegations, examining my documents and evidence, or interviewing my witnesses. A report of the false inquiry was ultimately signed by four persons whom I had never met. These four strangers signed the report and stated that there was no harassment beyond any doubt. Even before the false inquiry, my dismissal had been planned, as my name had been removed from the organigramme without any explanation. I share my story because, once again, my abuse is a symptom of an even deeper, much larger problem. If Nestlé or other companies can behave this way, break the law and bully individuals and communities alike, it is because public health and judicial authorities are failing to meet their responsibilities. During my 10 years with Nestlé, there had never been an inspection conducted by any regulatory authority. We had over 100 incidents reported to the head oﬃce per year, including numerous crises, and yet no authority had ever investigated our failures in food safety management or held the company accountable for its actions or eventual failures. A certification body visited Nestlé but failed to visit our department which dealt with the most important function of any food company, the management of food safety. Even when I reported incidents to public health authorities, they were not interested in investigating food safety management problems that I reported. They were not interested to learn from my experiences. International Unions, or humanitarian or consumer organisations that should care about the harassment of employees have all remained indiﬀerent to the problem, regardless of the severity of victimisation of whistleblowers. Over 300,000 Nestlé employees witnessed failures in management and my persistent and lengthy harassment, yet they all remained silent. I reported my harassment experience to the general public, the entire food sector from governments to industry and academia, all remained silent. Worse, the professional associations and technical media who are in the best position to understand the failures in food safety management, also closed their eyes and participated in a code of silence. What can explain this deliberate ignorance ? They are all afraid of Nestlé, I am told. Our society has been taken hostage by fear! I may say. 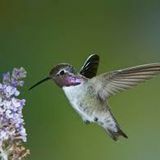 What choice does someone in a position like me have when an employer denies any wrongdoing and because of business secrecy laws, employees do not have the right to speak up? The only option for me was to report my case to judicial authorities. However, even then I was subjected to retaliation. Nestlé counter-sued me for violating professional secrecy. Nestlé also teamed up with my litigation insurance company, that I had to challenge in another court. After being fired from Nestlé, the Fonds de Pensions Nestlé (Nestlé Pension Fund) sued me for my publication activities and for my eﬀorts to survive professionally. These are just a few of the major hurdles I have faced. However, the path to justice is often long, arduous and full of pitfalls. Sometimes, victims have to confront false medical examinations, malicious lawyers, sham investigations, misleading facts or half-truths, character assassination and more. It is diﬃcult to put into words the cost I have paid in terms of my health, the well-being of my family, the strain on my financial resources and the impact on my life overall. Although the impact on me has been profound, it remains a symptom of an even larger problem. The main problem is the justice system. After 8 years of judicial battles, standing alone against a giant corporation and other large companies, the Swiss court confirmed that I had been subjected to psychological harassment. However, surprisingly, the court refused to condemn Nestlé and to compensate me for my expenses and losses. To this end, the court considered my request to be inadmissible and viewed that Nestlé had acted legally. The court decided to ignore the fact that Nestlé never examined my concerns for food safety and regarded the punitive transfer that Nestlé had oﬀered me to be a fair measure. The court also regarded the false inquiry that Nestlé had conducted as a legitimate investigation into my harassment case and accepted the testimony of Nestlé witnesses, some of whom lied under oath, were vulgar, or demonstrated contempt for the court proceedings. There were no consequences for the manager responsible for both the mismanagement of food safety and my harassment. He remained in his senior position and was never sanctioned. When the justice system allows companies to commit social and professional assassination of whistleblowers without sanction and turns a blind eye to their alerts against wrongdoings, then I can only conclude that our system is corrupt. In the end, the Nestlé compliance manager was right. He knew when he told me to turn to the law that they would suﬀer no consequences. Although my whistleblowing experience started by attempting to deal with lapses in food safety management, my story ends by showing a total dysfunction of our society. My experience is similar to the situation of other whistleblowers in Switzerland and in other countries, as if the same formula is applied again and again to dismantle the lives of whistleblowers, our health, reputation, social status and financial security.2 ,3 The irony is that my story is happening in Switzerland, the country that best symbolizes democracy and rule of law, and it is taking place under the nose of the very organisations set up to protect human rights and public health. Although, the events reported above took place in Switzerland, the results of Nestlé mismanagement in food safety can have consequences anywhere in the world. My case shows that, in a globalised world, the lack of a fair legal and judicial system in Switzerland, as it pertains to whistleblowers, is a threat to the interests of communities worldwide.